How to Reset my Lucis? Lucis Is easy to reset! Use the magnetic reset or "play" coin on the right spot to reset your lamp into factory mode and preserve battery power. The coin can also be used to travel with your light and actually is your ON/OFF button. Lost your magnetic coin? No Worries any strong enough magnet will work. How can i use the Light programs? 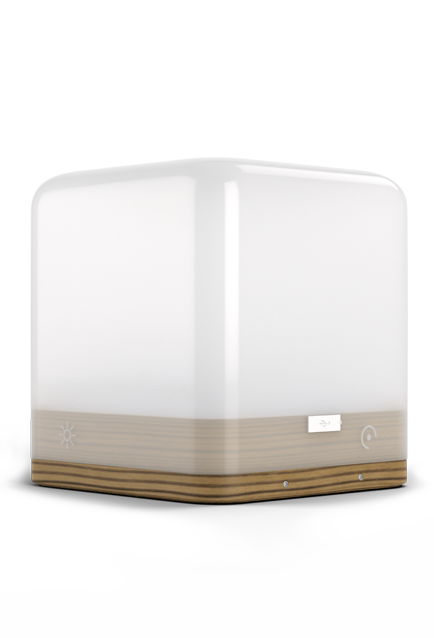 Lucis Wireless Lamps have 4 touch sensors. Holding multiple touch sensors simultaneously will start a light program. Learn more about the 3 different light programs in your quick start guide. How can i charge my Lucis? When your lucis is empty it will flash 3 times before shutting down this means you should charge lucis. You can fast charge your lucis with the power charger delivered in the box or any other micro usb charger available on the market. Normal chargers will take longer to fully charge your wireless mood lamp. Every Lucis portable lamp is equipped with a standard 1/4" tripod connector in the bottom of the lamp. Its easy to screw your tripod onto the lamp or any other accessories for that matter. There are multiple ways to turn your Lucis ON/OFF but disconnection the battery to fully preserve battery power can only be done with the magnetic "play" coin. You can hold the dim sensor until the light is off, you can use the shake sensor to shake lucis 3 times to turn your lamp ON/OFF and if you want to PRESERVE BATTERY power use the magnetic reset coin "play" coin to totally shut your lucis down. Yes all Lucis portable lights are splash proof ready to use in & outdoors. But Lucis is not waterproof. So keep in mind that you can't drop your Lucis in a swimming pool but you can easily clean your lucis with some water. What kind of Accessories are there? Lucis wireless lighting is constantly innovating and updating its product line. New tripods, quadpods and different accessories will be available throughout the year. Check our product & accessories or webshop to view the latest accessories for travelling or hanging your lucis in the garden. Can i drop my Lucis? We won't advice you to drop your lucis. The lamp is made from the highest grade plexiglass and ABS or wood & aluminium material. Dropping your light from most heights will easily damage or break the upper housing. Haven’t used Lucis in a while and/or having troubles getting Lucis back to work? This is how you fix it! When Lucis is empty your lamp will flash 3 times before shutting down. All electronic equipment will slowly discharge over time. To truly disconnect your battery and preserve battery power when your not using your Lucis for a while can only be done by putting the magnetic "play" coin on the right spot. If the online trouble shooting or FAQ page did not help answering your question feel free to email us with any enquiries.